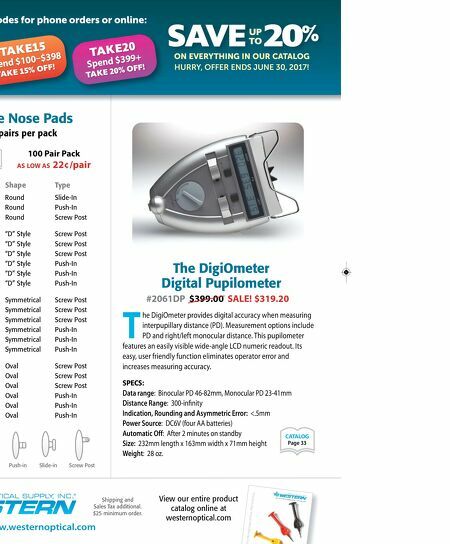 The DigiOmeter Digital Pupilometer T he DigiOmeter provides digital accuracy when measuring interpupillary distance (PD). Measurement options include PD and right/left monocular distance. This pupilometer features an easily visible wide-angle LCD numeric readout. Its easy, user friendly function eliminates operator error and increases measuring accuracy. SPECS: Data range : Binocular PD 46-82mm, Monocular PD 23-41mm Distance Range: 300-infinity Indication, Rounding and Asymmetric Error: <.5mm Power Source : DC6V (four AA batteries) Automatic Off : After 2 minutes on standby Size: 232mm length x 163mm width x 71mm height Weight: 28 oz. #2061DP $399.00 SALE! $319.20 CATALOG Page 33 Silicone Nose Pads pairs per pack 100 Pair Pack AS LOW AS 22¢/pair Shipping and Sales Tax additional. $25 minimum order. ww.westernoptical.com View our entire product catalog online at westernoptical.com Shape Type Round Slide-In Round Push-In Round Screw Post "D" Style Screw Post "D" Style Screw Post "D" Style Screw Post "D" Style Push-In "D" Style Push-In "D" Style Push-In Symmetrical Screw Post Symmetrical Screw Post Symmetrical Screw Post Symmetrical Push-In Symmetrical Push-In Symmetrical Push-In Oval Screw Post Oval Screw Post Oval Screw Post Oval Push-In Oval Push-In Oval Push-In Push-in Slide-in Screw Post SAVE 20 % UP TO ON EVERYTHING IN OUR CATALOG HURRY, OFFER ENDS JUNE 30, 2017! codes for phone orders or online: TAKE15 Spend $100–$398 TAKE 15% OFF! 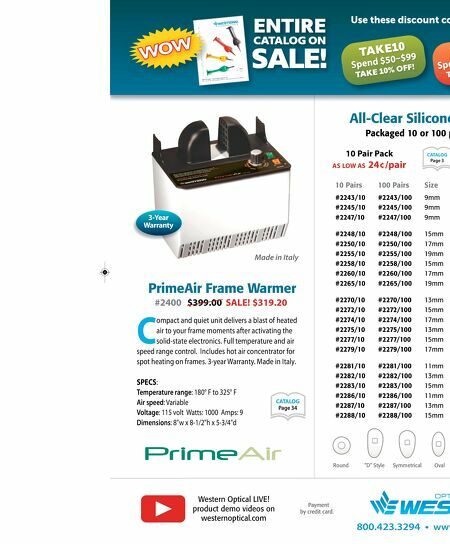 TAKE20 Spend $399+ TAKE 20% OFF!